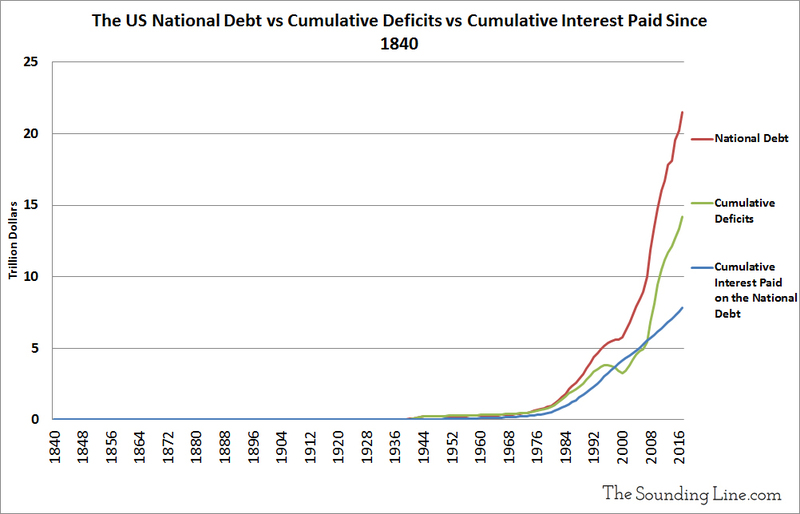 The last time the US completely paid off the national debt was in 1840. It was the result of decades of balanced budgets under Presidents James Monroe, John Quincy Adams, and Andrew Jackson. In the 179 years since 1840 (counting the 2018 budget), the US has run a deficit 109 times and a surplus or balanced budget just 70 times, amounting to a cumulative net deficit of $14.2 trillion. All of the surpluses combined in the last 179 years amount to $580 billion, less than the deficit in 2017 alone ($665 billion). Since the national debt was last eliminated in 1840, the US has paid a cumulative $7.8 trillion of interest on the national debt. This interest includes repaying principal. Simple arithmetic reveals that 55% the $14.2 trillion in deficit spending since 1840 has, in effect, gone towards servicing the national debt. Put differently, instead of paying down its debt with tax revenue, the federal government has essentially rolled over 55% of its debt since 1840 with new debt. The result is that despite running ‘only’ $14.2 trillion in deficits over that last 179 years, and despite having already repaid all debt issued more than 30 years ago, the national debt today is $21.4 trillion. The difference, $7.2 trillion, represents the cumulative interest the US has paid to fund its deficits minus its modest surpluses. As a result, a full 36% of today’s national debt is, in effect, the interest paid on past debt. Only 45% of the national debt went to spending on actual programs. The rest went to servicing the national debt itself and to rolling the debt over with new debt. It also means that the government has been carrying forward the majority of the national debt going all the way back to 1840 by paying it off with new debt. A portion of the money the government borrowed in 1841 is still being paid for today via rolling the debt forward. The last time the national debt decreased on a yearly basis was in 2000 when it fell from $5.7 to $5.6 trillion dollars. Since 2000, the US national debt has nearly quadrupled to $21.2 trillion and the US has spent a cumulative $4.1 trillion dollars on interest expenses, more than during all previous American history combined. Yet, because so much of the recent growth in the national debt has taken place since the 2008 Financial Crisis, and has been borrowed at historically low interest rates, taxpayers have been shielded from much of its cost. However, if the federal government continues to borrow at the same rate or higher, as it is planning to do, there is a good chance that future borrowing will come at significantly higher interest rates. 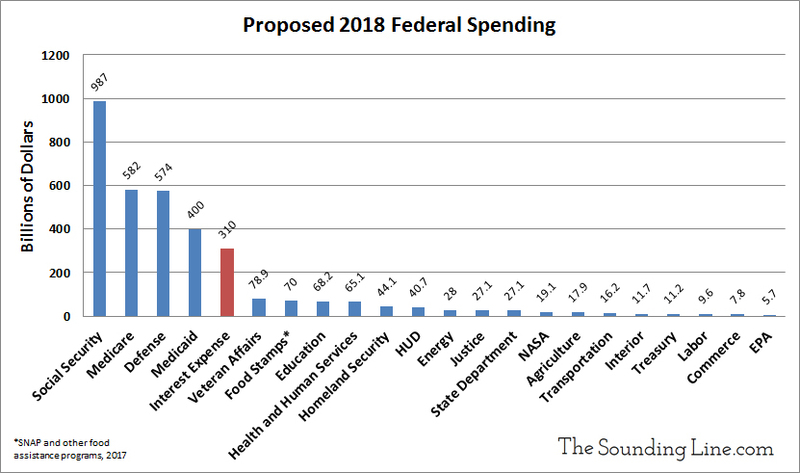 Consider that the government already spends more servicing the national debt than the combined amount spent on food assistance for the poor plus the departments of: Homeland Security, Housing and Human Development, Energy, Justice, the State Department, NASA, Agriculture, Transportation, the Interior, and the EPA. If debt levels and interest rates rise, even more government spending will be diverted from real programs towards servicing the national debt. It is a total waste of tax-payer money. Now is the time to balance the federal budget. The economy is expanding, the labor market is relatively strong, the need for large fiscal stimulus is low, and borrowing may get much more expensive in the near future. In the long run, not doing so is simply a massive waste of taxpayer money.